Download the Instructions for completing School Survey for Non-State Schools - Queensland 2019 [PDF 1.36MB]. The Board is interested in your feedback in relation to the administration and collection of the Census data. The feedback submitted will be used to improve and refine the process of how the Census is maintained and performed from the user's perspective. Following submission of the Census form, please take a few minutes to complete the Census 2019 - Feedback Survey. Any schools adversely affected by recent/current weather events, that need extra time to submit their enrolment census returns for the prescribed Census Day (i.e. Friday, 22 February 2019), are advised to contact the NSSAB Secretariat by phone 3034 5257, or email: nssab.admin@qed.qld.gov.au. Forms are due to be submitted by Friday, 1 March 2019. Please note that students enrolled at a school as at Census Day, may be included in the school’s census return if they were prohibited from attending the school up to and including the Census Day because of the weather event. To be clear, this includes students for whom a school is eligible for recurrent grants. The Board has developed a number of vodcasts to assist users with the completion of the School Survey Data for Non-State Schools – Queensland 2019. Please click on a link below to view the vodcast. 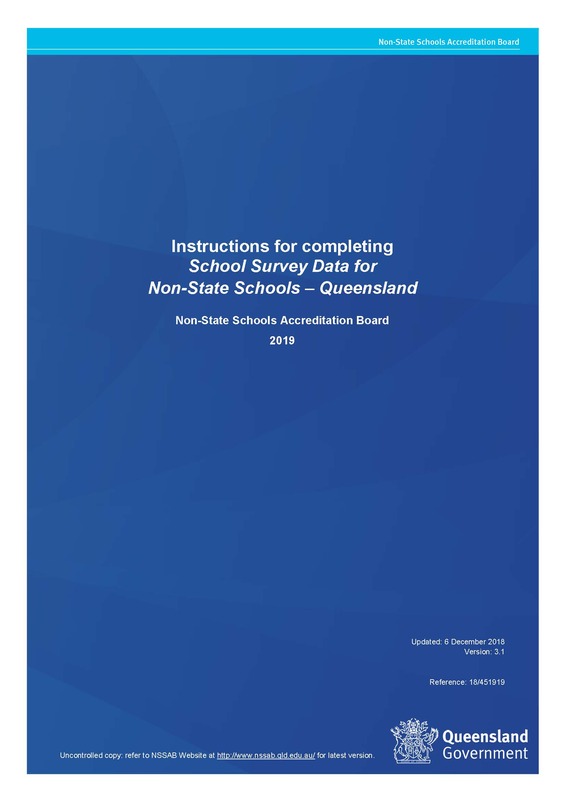 Data provided in the School Survey Data for Non-State Schools – Queensland 2019 (the ‘Census form’) are used by the Non-State Schools Accreditation Board (the ‘Board’) in connection with its statutory functions. The data are also used by the Queensland Department of Education (the ‘Department’) in assessing the entitlement to allowances distributed to governing bodies of non-State schools on behalf of the Queensland Minister for Education. Overseas students, who are responsible for the cost of their own education, do not receive state recurrent funding. These students are to be excluded from all sections of the Census form, except the section titled Overseas students. The Census Day is the last Friday of February of each year. Complete the Census form using data as at Friday, 22 February 2019, except for Boarding fee concessions, which refers to 2018 data. The completed Census form is to be submitted to the Non-State Schools Accreditation Board Secretariat (‘NSSAB Secretariat’) via NSSAB Online Services no later than Friday, 1 March 2019 (Friday following Census Day). Further instructions regarding the download of the Census 2019 form can be found on the Download the Census form page. Legislative changes require that all enrolment, attendance and related documentation used in completing the Census form is to be retained by the school/governing body for a period of five years from Census Day, and in a way that ensures the integrity and security of the data and documents.